This is the first in a series of pieces spotlighting many of the drivers featured during the early existence of Race Chaser Online as a motorsports news website, going back to mid-2013 and drawing the timeline forward to where those drivers find themselves in the present day. Whether they are still in the sport or now call a different place in life home, each of them has a unique story and can say they were positively impacted by the pastime that they and so many others have a passion for. DURHAM, N.C. — Four years ago, Carson Hudson had his sights set on similar aspirations to many of his racing peers: advancing up the ladder and finding a way to NASCAR’s national levels. He took a similar pathway into the sport as current stars like Chris Buescher, Joey Logano, David Ragan and Corey LaJoie, digging his heels in (mostly with a limited family budget) and trying to carve out a name for himself in the Bandolero and Legend car ranks, through which all the drivers named above began their career and which also launched young guns William Byron and Chase Purdy into the spotlight as well. Hudson found success, winning a touring series championship in 2012 under the now-defunct Carolina Competition Sports sanction and adding race wins at several Carolina area race tracks to his resume in a push to find the right support to get to the next level. He even weathered a near-fatal highway accident in 2013 that forced him to spend much of the season outside the race car, coming back stronger and reeling off a string of wins that kept the dream burning in his mind. Among his most notable moments during that comeback stretch was a photo finish in December of 2013, in which he battled tooth-and-nail with current Bojangles’ Summer Shootout contender Josh Kossek for a Bandolero win at Ace Speedway, edging out Kossek at the checkered flag by less than the width of the front bumper for the victory. “That was one of those moments that not only sticks in your mind forever, it makes you believe, ‘Hey, maybe I really can make something out of this and go places,’” Hudson recalled. 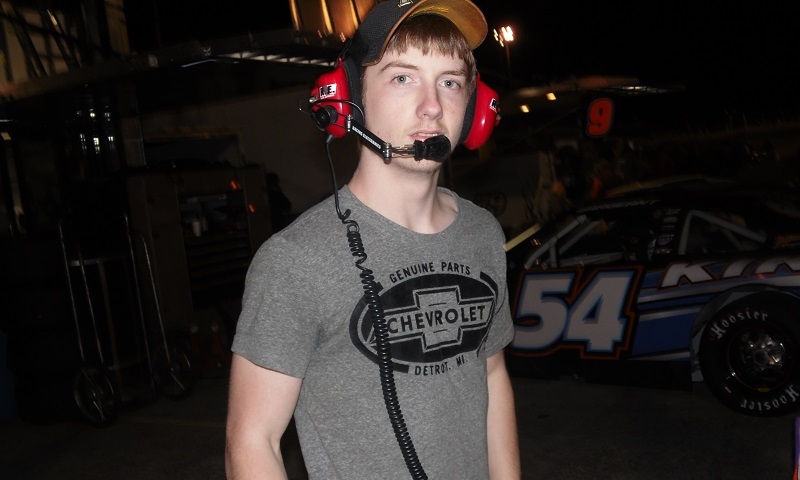 But like many in his age group with aspirations of breaking through into the NASCAR ranks, Hudson’s pathway forward eventually stalled as his family’s funding trickled out, forcing him to regroup as life took him towards a different path. Months, then years passed and Hudson began to follow that alternate path in the road. He graduated from Graham High School last summer after four years split between racing and wrestling, both sports that he had a drive for. But despite five high school wrestling medals (three bronze, a silver and a gold), a 27-4 overall record and the senior captaincy; along with a touring series championship and numerous trophies from his INEX competition days; eventually Hudson began to realize that while both racing and wrestling were things he was passionate about, neither were going to be the fields that supported his livelihood. That being said, he needed something that would be able to sustain that livelihood, and found it by taking matters into his own hands.